Music: Jimmy Cliff, “The Harder They Come” – A little summertime music for a summertime meal! Menu: Dijon mustard and apple cider vinegar grilled pork chops, and Kate’s green beans with mint. 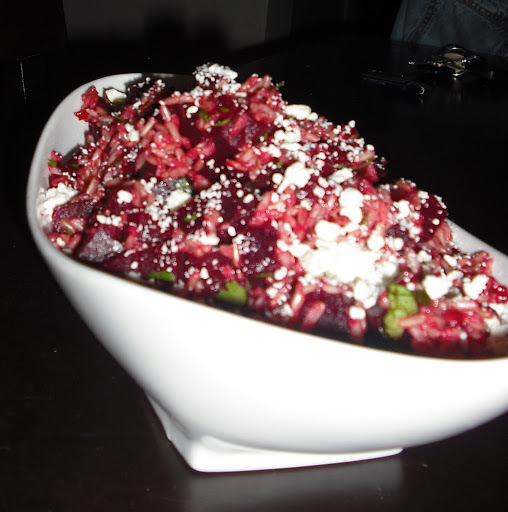 As promised, another beet recipe. I’m serious about learning to like these nutrient-packed, bright-red, crazy little buggers. Guess what? It worked this time!! This salad is so, so, so good. My sister was weary and she had a friend over that also looked at me like I was crazy when I asked him if he liked beets. But everyone at the table asked for seconds, I know, I was stunned too. This recipe is actually pretty simple. There is not a lot of hands on time. Best part: you cut the beet before it cooks, reducing the murder-like scene that usually happens after roasting a beet to only cut up right after. There was still a bit of red, but I used an extra plastic cutting board I have a kept the mess concentrated to that and my hand. After the last experience with beets, I was determined to try again, knowing that if I could find the right flavor combos, I would love ’em. The next quest came after an epic trip to our local farmer’s market. The above picture contains one bag of purchases from a farm just outside the city. Ready for this one….everything pictured was $5. Organic, local produce, and all $5. 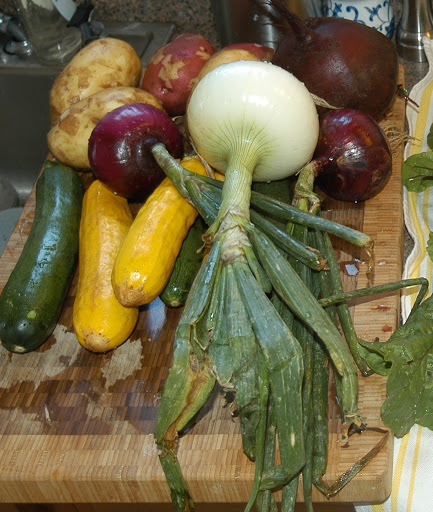 If I would have gone to the supermarket and tried to grab all this produce, looking for local and organic, my guess is that I would have spent somewhere in the range of $7-8. Organic veggies price tags are harsh. I admit, I rarely venture over to the organic bin, unless I see big yellow sale tags. Even then, I usually cannot meet the price. So, if you’re in the same boat, but local and check out some farmer’s markets in your area. * I used pecans, cilantro, and feta cheese because I had those things on hand. It still came out incredible and I didn’t have to make a special trip to the store and spend extra money to make the recipe exactly as printed. Bring 1 1/2 cups water to a boil in a small saucepan. Stir in rice, bay leaf, and salt; cover. Reduce heat to low; simmer 30 minutes. Remove from heat; let stand, covered. Meanwhile, toast pine nuts/pecans in oil in a 10-inch skillet over medium heat. Cook, stirring, until nuts are just browned, about 5 minutes. Transfer nuts with a slotted spoon to a small bowl. Reduce heat to medium-low; add onions and garlic to skillet. Cook, stirring occasionally, until onions are translucent, about 8 minutes. Add beets and 1 teaspoon salt; season with pepper. Cover; cook, stirring occasionally, until beets are tender, about 25 minutes (if beets stick to skillet, add up to 1/4 cup water). Remove bay leaf from rice. Stir rice, half of pine nuts, the lemon zest, and parsley into beet mixture. Transfer to a platter. Top with remaining pine nuts and the goat cheese. Garnish with parsley. Serve warm or at room temperature. This entry was posted in side dish, Vegetarian by callywoodfarms. Bookmark the permalink.